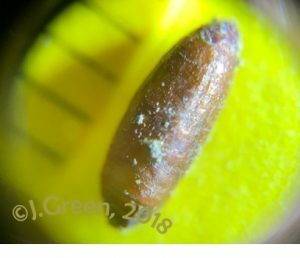 Seed corn maggot – Poor emergence may be a sign of underground feeding by seed corn maggots, which are the immature stage of Delia platura, the bean seed fly. Plants are most susceptible at seedling stage. Host plants include: green and broad beans, onion, brassicas, peas, pepper, potato, spinach, and beet. SCM is especially attracted to newly-tilled soil with high organic matter / manure inputs. They have multiple, overlapping generations per year. This image by U. of Illinois highlights how adults, eggs, and maggots may all be present at the same time. If emergence is low, scout 2-ft row sections for seed damage and white, tapered maggots that look very similar to cabbage maggot. 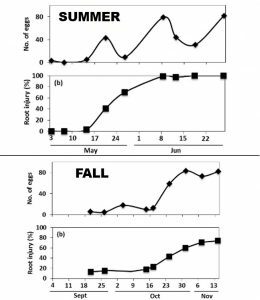 Both species favor cool conditions for egg-laying, but D. platura are more active as adults in warm weather. There is a fascinating biological (fungal) control for SCM that alters the fly’s behavior: It causes the flies to settle on tips of grain stems or high-up flowers and die, which increases dispersal of the fungus to spread farther. Seed bugs – There have been recent complaints of high numbers of ‘small, flying insects’ in both urban and rural areas since mid-April. The bugs are 3-4mm with elongate bodies and wing covers with 4-5 veins. Experts agree that the taxonomy of this group is in need of a major revision, so they are usually referenced to genus level only. More than half of all known Nysius species are from Hawaii, including the endemic wēkiu bug, that migrates to the summit of Mauna Kea each year. Nysius spp. are seed predators and tend to be less selective then other, related Lygaeidae. Extensive damage can occur in wheat, quinoa, canola, and sorghum. Occasional feeding can occur on ornamentals, other cereals, and tomatoes. Similar to boxelder bugs, they are attracted to large, sunny, white buildings, which has led to nuisance reports by homeowners. Various Ask-an-Expert questions have been submitted, one of which I was able to identify last week as Nysius, probably N. raphanus. The high numbers we are seeing now is likely the result of overwintered nymphs maturing into active, winged adults. There are 4-7 generations per year. Posted in cabbage maggot, pest ID, snap beans. 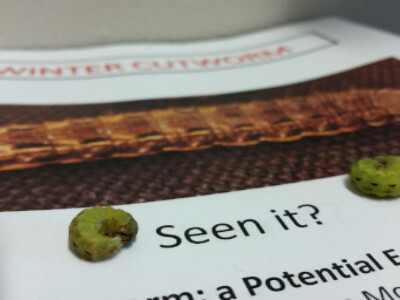 WEEK 24 – Cabbage maggots are one of the most challenging pests for brassica growers. They tunnel through root tissue and increase the risk of exposure to plant pathogens Read this cabbage maggot page, which includes more info on biology and how to sample for them. Another late season pest is diamondback moth. 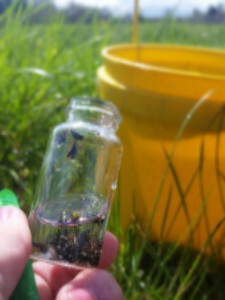 Many sites are listed as "n/a" this week, because fields have been harvested and traps are being removed. Read the full report here: http://bit.ly/VNweek24 and subscribe on our homepage to receive weekly newsletters during field season. Posted in brassicas, cabbage maggot, diamondback. NOTE: If you are seeing this, but did not receive the same version direct to your email, please contact me. Conversely, if you’ve stumbled upon it and want to subscribe, use the link at left. Thanks! Traps are being set this week. Stay tuned for a full report next Friday. 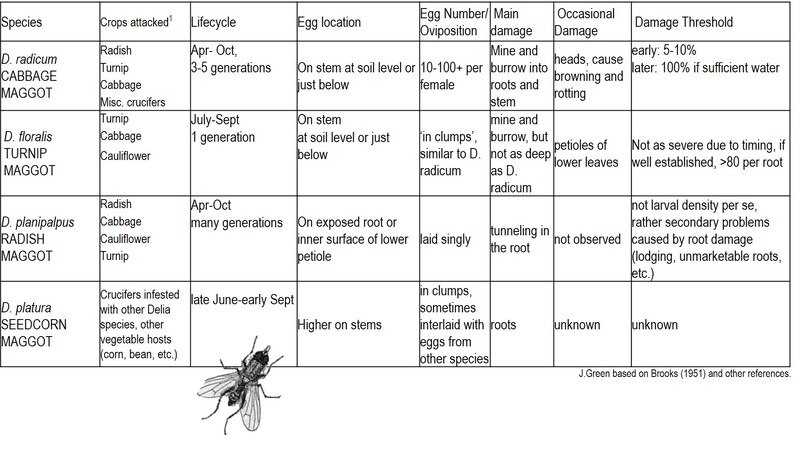 VegNet is an insect pest monitoring program funded by the Oregon Processed Vegetable Commission and managed by the Oregon State University Department of Horticulture. To add your name to this newsletter, please click the ‘subscribe’ button on the homepage.